I sifted the flour, malt and a little sugar together, aerated it for about a minute with the paddle attachment, proofed the yeast at 85 F and kept the water at about 44-45 F. Also lowered the yeast amount to 0.3%. After the flour, water and yeast misture were mixed together I let it rest in the bowl for about 30 mins before adding the rest (salt & oil). The main mixing time was 5 mins. 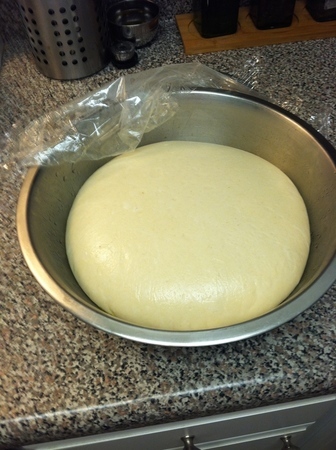 The dough rested on the counter for an hour after that, was balled and then went into the fridge for tomorrow evening. Very smooth dough. I went with a 61% hydration this time because I'd like to get closer to a more authentic looking NY-style crust. I noticed that the crust really "explodes" in my hot oven when I use the Pizza Bible's suggested 65% hydro and 1% yeast. Does it maintain its shape at 24 hours or does it flatten? I attached another pic which shows the dough after 24 hrs in the fridge. It has risen but not to the extend that it would need to be degassed(knocked down). It's still very smooth. FWIW, I didn't use any bench flour when shaping it yesterday. I simply used the surfaces' tension in pulling it together just like you do when making a loaf of bread. Thanks. I am still experimenting with flours, having made doughs yesterday with Trumps and Pendleton Flour Power. Using the master recipe, each seemed too dry, so I added a bit more water, which may have been a mistake. I will find out today when I ball them. I wish the pics had an enlargement feature for better viewing. I agree, the pics are too small. is there anything that can be done about this? Hey guys-- I'm working on this. I store larger versions of the image and they'll be available very soon. Long story short, trying to get everything to work well for mobile, and larger screens. Soon, I promise! That's great, thanks Raj! When someone makes a great pie, I want a closer look! Hi Clark, Just wanted to let you know that larger images will now be shown on the site. This applies to all images retroactively.